This week has left me nearly empty handed as far as creative endeavours go. I have been tinkering with code for the website shopping cart, writing an article, and stocking shelves in the studio after a rather large shipment of supplies arrived. Oh, and of course the most loathly task of all, dusting shelves and cleaning. 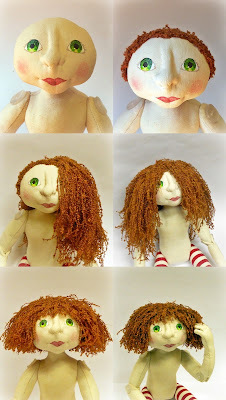 As a reward for cleaning, I did finish making hair for my Annie style doll. This was fun. First I crocheted a skull cap, then I added the individual strands of hair the way that one would make a knotted rug. Then came the trimming. This was scary. That’s my mother’s fault. I distinctly remember a good hiding I got after trimming my own fringe when I was about three years old. I think I never held scissors for a long time after that. Trimming Annie’s hair was fraught with anxiety. I kept checking to see if someone was going to catch me at it. But I was brave and I did it. Tomorrow is my sister’s birthday. She has such a busy social life that I had to phone her today already to wish her a blessed year. To celebrate she is going hot air ballooning and dining with friends. I got her a snazzy handbag in the shape of an owl, but don’t go blabbing, she hasn’t seen it yet! Also tomorrow, I’m getting together with a group of doll crafters to work on our projects. I haven’t decided yet what I’m doing. Fortunately I have no end of UFO’s lying around, I will just grab a likely candidate and give it a go. If I feel like being different, I might even work on a bear! Missed a whole week of keeping up with the blog... We need more weekends! HeHe, I think we all cut something with a pair of scissors that we shouldn't have cut when we were small, at least you hair grew again, my poor Barbie doll never recovered from the haircut I gave her. Annie looks beautiful, I love her hairdo! Thanks, Elga. And another weekend has flown past too! I'm looking with interest at all the lovely things you are doing. Annie's hair is gorgeous - makes me want to perm mine again! Thanks for Annie's hair compliment. One thing I never did was stick my finger in a wall socket. In fact, my mother handed out such dire warnings about electricity that I always went around switching off wall plugs. I was frightened the electricity would leak out through the holes and follow me around the room. What a ninny I was!